Bounce House & Event Rentals | IjumpFun.com San Jose CA. We are proud to serve the entire Santa Clara County. This includes parts of the Bay Area such as Sunnyvale, Santa Clare, Mountain View, Cupertino, East Palo Alto, Palo Alto, Redwood City, Menlo Park, Morgan Hill, Atherton, Monte Sereno, Atherton, Los Gatos, Milpitas, Union City, Fremont, Newark and all other cities in the Bay area. Making your event and party reservations is fast and east with our secure online reservation system. Just click the "Start Here" link below and enter your event date and times. Then as you browse all the exciting items on IjumpFun.com you be presented with those items that are available on your selected date and times. As you find items you would like to rent just click the "Add to Cart" button located on every product page. When you're finished, select checkout and you done. Let's get your party started now! HOLIDAYS - Closed Thanksgiving, Xmas Eve, Xmas, New Years Day. WHAT'S NEW? CHECK IT OUT!! Everybody likes to save money and know that they got a good deal. So do we! That's why we have pooled our years of experience and resources to bring the most popular items and the extra equipment you'll need to have a successful celebration. Combine that with a great package price and you're just one click away from having a great time! 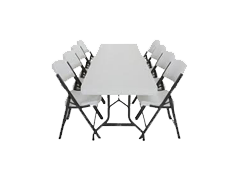 Get deals on jumpers, tables & chairs, concession machines and much more! Interactives come in a variety of choices, like our inflatable climbing wall shown here, or obstacle course, inflatables slides, sports game and so much more. 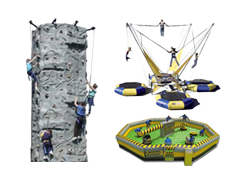 iJump Party Rentals has a large selection to choose from, and all are designed to bring your guests together in fun and friendly competition. Our interactive units will be the centerpiece attraction at your event! Let's get the jump start on your next event today! Having a concession stand set up and running at your event or celebration can make all the difference. Perfect for school fun days, church fundraisers and company picnics, our easy to use concession rentals will have your guests lined up with smiles on their faces. 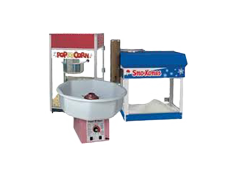 Choose from popcorn machines, son-kones, cotton candy and hot dogs. Rent one or rent them all and create your own carnival midway! 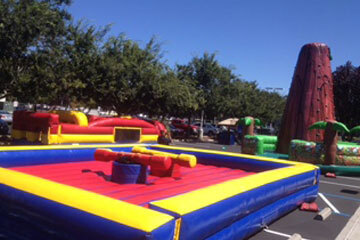 Our team at iJump Party Rentals rent out the top-of-the-line party rentals for San Jose. Our variety of party rentals include and are not limited to bounce house, water slide, tent rentals, and interactives like Giant-Glove boxing, joust, rock walls, and more! 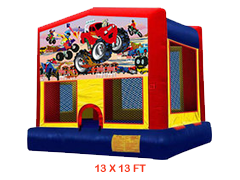 We have nearly 30 themed bounce house rentals to choose from. These include all of your favorites such as Disney Princess, Toy Story, Finding Nemo, Mickey and Friends, and many more bounce house rentals. 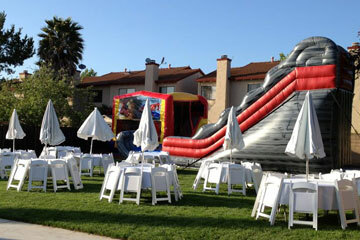 We rent hard to find Raiders and 49ers bounce houses and combo units which are fantastic party rentals. Of course, what toddler doesn't love Dora, Sesame Street, or Winnie The Pooh Bounce house rentals? We have them all and many more! We even have inflatable rentals for tweens and teens. Girls will be jumping all over our Bieber bounce house rentals! All our rentals shown on the site are exactly what you will receive. Our bounce house rentals and party rentals are perfect for all occasions such as birthday parties, graduation parties, church and school events, corporate events, and so much more. You can enjoy our amazing party rentals, interactive games and bounce house rentals year round. 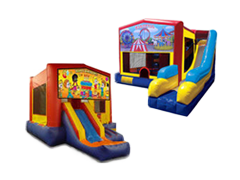 For larger events needing party rentals and bounce house rentals such as church and school events, we have a great selection of combo bounce house rentals, inflatable slides, and interactive party rentals. 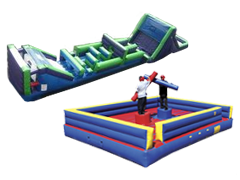 Interactive party rentals are equipment such as jumbo boxing, gladiator joust, and jumbo sumo wrestling for rent. These larger units are perfect for large scale events, and will help draw big crowds! Think of the bright colors, and the fun people will see from distances. Groups tend to bring in curiosity to the event. Combo party rentals are always some of our most popular bounce house rentals because they include both a bouncer as well as a slide, for one low price. You can get double the fun in one unit! 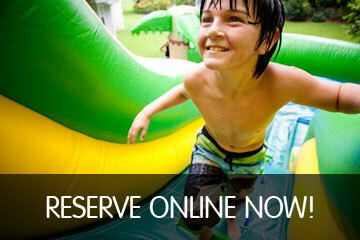 Reserve your bounce houses and water slides Online in Minutes. Creating your event and party reservations is fast and easy with our secure online reservation system. Just click the "Order-by-date" link below and enter your event date and times. This works with our software to show you only the party rentals and bounce house rentals that are available for your date and time, allowing you to choose exactly what you'd like from the available inventory keeping it simple and fast. As you find items, you would like to rent click the "Add to Cart" button located on every product page. One of the more popular party options are the waterslide rentals. These inflatable bounce house rentals will help quench California's heat. Our water slide party rentals are made from "Lead-free" vinyl. 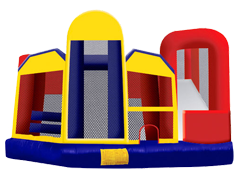 We care about our clients and want to deliver clean, dry, mold free bounce house rentals. Our products are inspected to ensure they are safe for everyone. Obstacle courses are great fun. Guests can challenge each other to matches. 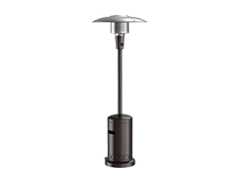 They are also great for larger events, as they have a large capacity. However, we offer some smaller obstacle course party rentals as well. So, mix it up a bit with our unique selection of obstacle course today. We have several options of Bounce houses to offer. They come in various themes and color options as well as different combinations to suit any need. Getting the perfect bounce house rental is easy, book them online, and we bring them to you, or you can pick them up. Our goal is to make party and bounce house rental bookings easy and fast. If you plan to pick up our items, keep in mind some of these can weigh several 100 lbs. We offer Concession rentals in addition to our other choices. 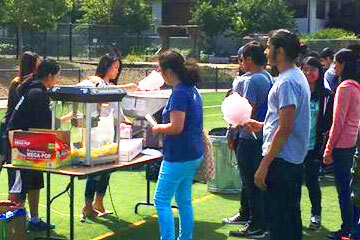 We are a one-stop shop for those looking to throw a giant carnival, festival or fundraiser. 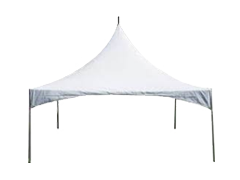 These go great with our bounce house and party rentals. We have linens for rent as well. We offer tables and chairs as well as the linens to decorate them. Add some class to your next party with our linen rental. 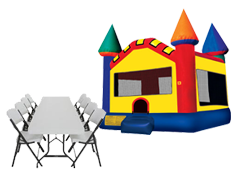 Combine this with some of our other party rentals and bounce house rentals we have to choose from. Yes, we offer inflatable rock climbing walls. These walls are very safe and sturdy yet provide a great challenge. Step up to the challenge and try one of our rock climbing walls. Arcade games are fantastic for fundraisers as well as a night out for the kids or adults. There are so many great choices, and with these games, you could literally could turn your garage into a amazing fun palace. 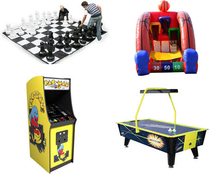 Rent some of the old time classics with our arcade game rentals or look around at the various bounce house rentals and party rentals we have to offer. Our rain policy is, watch the weather; if it looks like rain and you would like to cancel, you can do so by 5 pm the previous day. You will receive a refund for the amount and 50% of the deposit, or you can take the rain check option and choose another day. Unless the rain is terrible and could damage our equipment or be unsafe for people to be on, we will leave this decision up to you. What about setting up in parks? Setting up in a park is no problem. However, most don't have electricity. So, a generator will need to be rented. To see more about our Bounce house Rentals. Visit our FAQ page. Safety is everything. 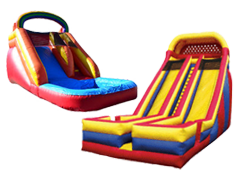 We purchase all our party rentals and bounce house rentals gear from the top manufacturers. We are licensed and are insured. Our company cares about our quality and standards and trains all our employees with SITO. It is imperative to hire a company that holds these accreditations when working with the general public. Accidents happen and ensuring you are prepared for any outcome is essential. Get the best Party Rentals and Inflatable Bounce House Rentals here at Ijumpfun.com.